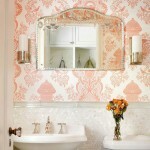 A pink bathroom in your home makes a statement! Love it or leave it, people are going to talk about it. It will have more of an impact on people, whether it is a contemporary, vintage or retro design than if you marbled your bathroom from floor to ceiling! If you want to have a pink bathroom you have to be one with the pinkness of it! for this is something that you shall be staring at everyday of your life and various times a day too! In order for a pink bathroom to work well and not be an overwhelming experience (especially for the males of the family) the key is to create balance. For a crisp and clean feel choose white and pink, you may also create great contrast with pink and browns. Make the doorframes and window-seal stand out in a pretty dark brown. 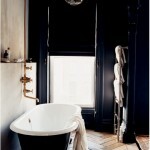 Let’s have a look at different examples of pink bathrooms to inspire your creativity! In this first bathroom idea we have a simple hot pink bathtub as the main feature of a pure white bathroom. This is a great minimalistic look, very clean, crisp and flattering. Next is a modern pink bathroom with a retro twist. Love the bubbly circular retro patterns in this latest Mimo bathroom design from Laufen. This is a more daring version than the example above with a room more heavily doused in pink. But by confining the use of the pink color to the walls, shower curtain and toilet seat cover this makes it easier and cheaper to change the color scheme later on. Keeping the most costly bathroom items such as the bathtub and toilet in a classic white means you can alter things inexpensively later. Modern pink bathroom with a retro twist. This entry was posted on Monday, April 11th, 2011 at 10:23 am	and is filed under Bathrooms, Pink. You can follow any comments to this entry through the RSS 2.0 feed. You can leave a comment, or trackback.